This Quick and Easy Avocado Hummus recipe is everything you love about guacamole and hummus in one, delicious bowl. It’s smooth and creamy… and incredible! 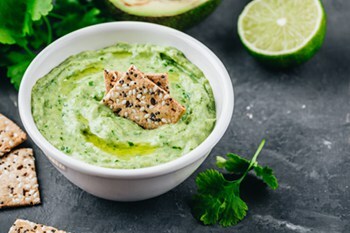 Combine chickpeas, avocados, olive oil, tahini, lime juice, garlic, fresh cilantro if using, and cumin in the bowl of a food processor; season with salt and blend until smooth. About 2 minutes. Transfer hummus to a bowl and garnish with fresh cilantro, red pepper flakes and drizzle with olive oil. Serve with pita or tortilla chips. If cilantro isn’t your favorite herb, simply omit it from the ingredients — it’s delicious either way!